This is a review for RX Liquids Hair Loss Rescue Vitamins for Hair Loss. The manufacturers claim this product reduces the levels of DHT to control hair loss. They also claim the product will help to strengthen the hair which already exists. To learn more about Rx Liquids Hair Loss Rescue Vitamins for Hair Loss and if it’s the right choice for you, read more. The website did not list any main or active ingredients, after research it was found that Saw Palmetto, B vitamins, Silica, and Horsetail were used in many other hair growth treatment products. They help stop hair loss while maintaining hair health, and aiding in new growth. Over all appearance of the hair is enhanced by these ingredients. One ounce of this liquid should be taken each day. It can be mixed with water or juice, and food should be eaten when taking this product. The website for RX Liquids Hair Loss Rescue Vitamins for Hair Loss listed no side effects. Further research showed no complaints on this product. If you are allergic to any of the ingredients this product contains you should not take it. Signs of allergic reactions are dizziness, vomiting, and trouble breathing, if you experience any of these when taking this product you should discontinue use immediately and see your physician. 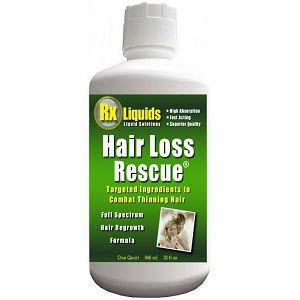 RX Liquids Hair Loss Rescue Vitamins for Hair Loss price is $27.16 for a bottle. One bottle is one month’s supply of the product. Shipping and handling are extra, unless your purchase totals over $75.00, then it is free. RX Liquids Hair Loss Rescue Vitamins for Hair Loss has a thirty-day money back guarantee if you are not satisfied with the results. RX Liquids Hair Loss Rescue Vitamins for Hair Loss contains many of the active ingredients in similar hair growth products. For those who have difficulty swallowing pills, this may be the best option in hair growth treatment. The website contained no consumer reviews, and research did not give any results. No negative or positive feedback was found. This is a vegetarian-friendly supplement. It should be noted that women who are pregnant or breast feeding should not take this product without consulting their physician first. People who are on medications should also consult their physicians before taking this product. There is a money back guarantee.Because information about where this product is manufactured could not be found and because the product lacks reviews, it may mean that you should be on the lookout for a different hair growth product. John Brownstone	reviewed RX Liquids Hair Loss Rescue	on August 3rd	 and gave it a rating of 3.